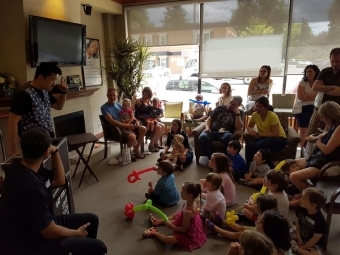 On Saturday, July 11 Royal York Dental was happy to host our annual Calling All Three Year Olds event in Etobicoke. On Saturday, July 9 Royal York Dental was happy to host our annual Calling All Three Year Olds event in Etobicoke! What is Calling All Three Year Olds? Calling All Three Year Olds is an annual event hosted at Royal York Dental. We invite the family and friends of our current patients to bring in their almost three year olds for an afternoon of fun! We have been hosting this event for almost a decade, and we are excited for future events. From Saturday at 1pm we close the practice and invite families into our office. We offer a series of fun activities for your children including a magician, "riding the dentist chair" and a tour of the office and equipment. We also provide refreshments for all to enjoy. Three years old is when a patient should see a dentist for the first time. We want to make sure your toddlers have a pleasant experience each time they come to the dentist. Having a fun event starts them off on the right path to oral health for life. How do I sign up my 3 year old? By contacting our office! Throughout the year we take down a list of names of our littlest future patients! When we have enough to have an event, we call to invite you - and even ask that you bring a friend. Our next event won't be for a little while, but it is best to get on the list today. Do I have to be a patient to come? If you are looking for a new dentist in the area, Royal York Dental provides services for children in the Etobicoke community. We are happy to provide family appointment bookings, serving many members all at once.